Summits Sponsored climbers took on a challenge that definitely separated the week from the brave! 3 Scottish Sea Stacks in 3 days. Here was the story: ‘September 2017, 3 women hope to complete a challenge that is unique in Scottish climbing history. 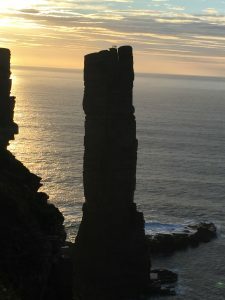 They intend to climb 3 classic sea stacks: Old Man of Stoer, Am Buachaille and the iconic Old Man of Hoy, in 3 days. Situated along Scotland’s Northern coastline the sea stacks are isolated pinnacles of rock, surrounded by the sea, accessible by scrambling, swimming and tyrolean traverse (zip line). 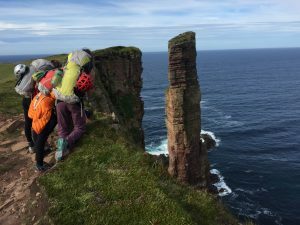 With over 200 miles of travelling between each stack (including 2 ferries) and 240 meters of rock to climb, the challenge of climbing all 3 in 3 days will provide an exhausting challenge unequalled in Scottish climbing history. All your donations will go to Urban Uprising, a Scottish grassroots charity dedicated to improving the lives of youths from disadvantaged areas in Scotland. The old man of Hoy was the last sea stack in the challenge, having topped out on the other two the previous 2 days they were on target. Walking from Rackwick bothy along the coast we found the Old Man of Hoy standing proudly out at sea. It is the tallest sea stack in Britain and the final hurdle for the climbers to tackle! The walk itself takes 30/45 minutes which is worth while just to be able to see the stack itself. The coast line is rugged and exposed but there are some good sections to camp as well. 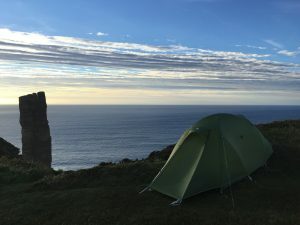 We were testing out the Force Ten Mtn 2 tent on the trip and it stood firm against the strong sea winds that were being whipped up by the cliffs. What a spot it was on the edge of Orkney! The 3 climbers finally completed the stack as the sun started to set behind them, completing their 3 sea stacks in 3 days challenge. Film producer Sandro (Sharp End Films) and staff from Summits supported and recorded their epic challenge and has been entered into a few film tours and evening winning best film at Woman in Adventure. To see more from the challenge head over to their Facebook page – 3 Women and the 3 Old Men.